"Wow!" 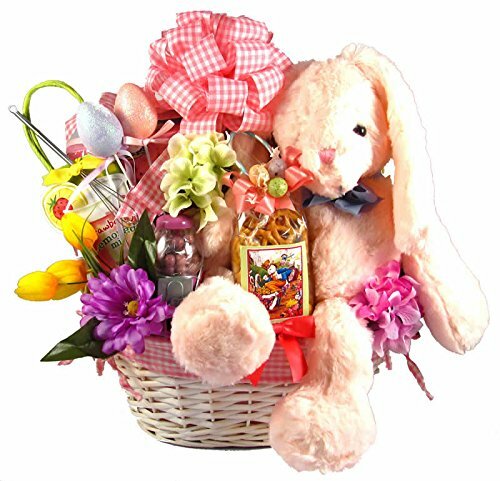 is the word that comes to mind when you first see this over sized, absolutely adorable, Easter basket close up. It is gorgeous! It is stunning and filled with a wonderful mix of Easter treats and gifts for them to enjoy. This large Easter basket is a very unique and gorgeous piece. It arrives filled with a large assortment of delicious Easter treats. Inside this deluxe Easter basket they will find: - A very (and we mean very) soft and adorable 16" plush Easter Bunny - A Wonderful Hardcover Book "The Legend of The Easter Egg" - "Bunny Trail Mix" (deliciously sweet and savory gourmet snack mix) - Belgian Chocolate Seahorses - Traditional Peeps Marshmallow Bunnies - Fruit Flavored Hard Candy Tin - Cinnamon Sugar Butterfly Cookies - Gift Boxed Set Of English Toffee With Mini Metal Hammer For Breaking Pieces Up - Chocolate covered Pretzels - Assorted European Chocolate Cookies - Dark Chocolate Mint Delights - Milk Chocolate Caramels - Chocolate Covered Blueberries - Refreshing Lemonade Mix in Large and Festive Summer Tote with Mini Whisk. This Easter basket is as sweet as they come and large enough for the whole family to enjoy!